Brahms is a Janus-like figure in music history: he simultaneously faced the past and the future. Reviving and enlarging the classical principles of Haydn, Mozart and Beethoven, his music has often been seen as a conservative reaction against the ‘new music’ of Liszt and, in particular, Wagner. Yet Brahms’ highly personal blend of Beethovenian dynamism, Schubertian lyricism and German folksong with the strict contrapuntal disciplines of the Baroque era created a powerful new musical synthesis. His example was just as vital as Wagner’s in the creation of the new music of the twentieth century. Though he appeared frequently as a pianist and conductor, after his thirties Brahms was financially successful enough to support himself as a freelance composer. Like Beethoven, he was a north German who based himself in Vienna, and remained a bachelor even though he was the centre of a large circle of influential musical friends. Brahms, born on 7 May 1833 in a slum district of Hamburg, was the second of three children to Johann Jakob Brahms, a town musician, and Christiane Nissen, a seamstress. His musical talent was evident in early childhood; he grew up studying J. S. Bach with local piano teachers and playing in dockside taverns to augment the family’s income. His first foray away from Hamburg in 1853–54 brought unexpected celebrity and the brief patronage of Robert Schumann. After Schumann’s suicide attempt in February 1854, Brahms remained in Düsseldorf, helping Schumann’s wife and family, until the older composer’s death. During 1857–60 he divided his time mainly between Hamburg, where he conducted a women’s choir, and an annual appointment at the small ducal court of Detmold. In 1858–59 Brahms spent time in Göttingen, where he became engaged to Agathe von Siebold, then almost immediately broke off the relationship. Although his music was becoming more widely known, he continued to base himself in Hamburg, evidently hoping to succeed the ageing conductor of the town orchestra, but while he was visiting Vienna for the first time in late 1862, the post was awarded to another. Brahms left Hamburg in April 1853 to work as accompanist to the Hungarian violinist Eduard Rémenyi (1830–98), who introduced him to his fellow-countryman Joachim, already recognized as the greatest violinist of the age. When Rémenyi decided to go his own way, Joachim gave Brahms introductions to Liszt and Schumann. A walking tour of the Rhineland brought Brahms to Düsseldorf at the end of September. Here Schumann was astounded by his compositions and forthwith arranged for some of them to be published in Leipzig by the end of the year. In an article for the influential journal Neue Zeitschrift für Musik he hailed Brahms as ‘the chosen one … destined to give the highest expression to the times’. In February 1854, Schumann’s madness, suicide attempt and sub­sequent incarceration in an asylum left Brahms without a patron, yet he chivalrously assumed the role of protector of Clara Schumann (1819–96) and her numerous children. Brahms was a solitary, difficult man, with a power­ful need for friendship. Among his most significant relationships were those with Clara Schumann, widow of Robert Schumann, and the violinist-composer Joachim. Fourteen years his senior, Clara rep­resented a romantic ideal of womanhood and was also one of the most gifted pianists of the century. Soon after their first meeting, Brahms realized he loved her. She returned his affection, though they are generally thought not to have been lovers. Clara’s advocacy as a performer helped to make Brahms’ piano music widely known. Relations with the touchy Joachim were more chequered, but he helped the young Brahms gain confidence in composition and did much, both as violinist and conductor, to promote Brahms’ cause. Brahms wrote several important works for him, notably the Violin Concerto and Double Concerto. 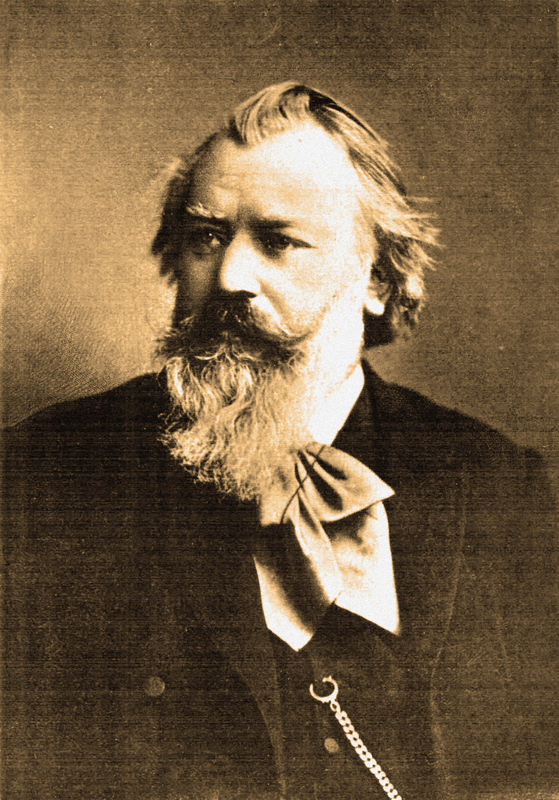 The lack of recognition Brahms had found in his home town contrasted with the warm welcome he encountered in Austria from such new friends as the influential critic Eduard Hanslick. He spent increasingly long periods in Vienna, and essentially settled there from 1863, when he accepted the conductorship of the Singakademie for a year. For three seasons (1872–75) he directed the concert series of the Gesellschaft der Musikfreunde (‘Society of the Friends of Music’), but a permanent post did not suit him and he lived otherwise as a freelance composer. Brahms began to reach a mass audience with his waltzes and Hungarian Dances for piano duet, and with vocal quartets and songs. He was deeply affected by his mother’s death and his major choral work, Ein deutsches Requiem (‘A German Requiem’), was written partly in her memory, and laid the foundation of Brahms’ international reputation. This work and the subsequent Triumphlied (‘Song of Triumph’) were much performed as patriotic music during the Franco-Prussian War, further enhancing his profile in Germany. Meanwhile, his profound chamber and instrumental works allowed him to master each genre in turn, approaching the summit of his ambitions: the symphony. From the time of the First Symphony (1876) Brahms’ place in European musical life was assured, and he received many public honours. In 1895 he was hailed as the ‘third B’ in a festival at Meiningen devoted to ‘the three great B’s – Bach, Beethoven and Brahms’. During his last 20 years, Brahms created his greatest masterpieces and established a fruitful relationship with the ducal orchestra in Meiningen. He aided many musicians out of his own purse and helped to further several notable careers, such as that of Dvořák. Brahms continued to travel widely, but this latter stage of his life was darkened by the deaths of many of his friends, and his music took on an increasingly elegiac character, for example in the autumnal Clarinet Quintet, and the Vier ernste Gesänge (‘Four Serious Songs’) to biblical texts, written after Clara Schumann’s death in 1896. He died of cancer of the liver on 3 April 1897. Brahms blended many influences into a potent and highly individual idiom. He felt that the programmatic music advocated by the ‘New German School’ was damaging the essentials of the art, and in 1860 he published an unsuccessful manifesto directed against Liszt and his followers – his only foray into public polemics. On the other hand, he admired Wagner, whereas Wagner resented Brahms’ growing reputation and sought to belittle him as a mere academic. Brahms indeed was in the forefront of the nineteenth-century movement to arrive at a fuller and more accurate understanding of earlier masters, and studied their music more systematically than any composer before him. The profound influence of Beethoven is obvious in the monumental First Piano Concerto and First Symphony, but Brahms was equally inspired by Mozart, Haydn and particularly Schubert, whose major works were only being rediscovered in the 1860s. Far more than most contemporaries, he was aware of George Frideric Handel (1685–1759) and J. S. Bach, whose music was gradually being published throughout the late nineteenth century. Moreover he collected, studied and performed music from the Renaissance and early Baroque periods, which taught him the value of strictly imitative contrapuntal forms such as canon and fugue. He also collected and arranged many German folksongs, which helped to develop his richly lyrical style of melody. This broad synthesis of influences, allied to his uniquely flexible sense of rhythm, created many new possibilities for the composers who came after him, notably Reger and Schoenberg. (Updated extract from The Classical Music Encyclopedia, Edited by Stanley Sadie, Foreword by Vladimir Ashekenazy), Flame Tree Publishing, new edition 2014). Available in all good bookstores, on Amazon and our own website (with free shipping i the UK) here. This entry was posted on October 7, 2015 by Flame Tree Music in Biography, Brahms.